Cinematic greatness always comes from the spectacle. Sure, there's a lot more to it than just the way a film looks, but the visual dynamics are what really give a good (or even a bad and hackneyed) film movie magic. What could be happening on screen could be surreal (Federico Fellini's 8 1/2), larger than life (the falling rock in Spielberg's Indiana Jones And The Raiders Of The Lost Ark), devoid of plot (Tom Cruise swooping from the ceiling in Mission: Impossible) or logical coherence (The Matrix), but what matters is that we love it. And Stephen Chow's Kung Fu Hustle is just that -- vivid, bright, hilarious, and utterly madcap spectacle. From the minute the film starts and the members of the evil Axe Gang, only too conspicuous in their top hats, launch into a dance routine, the audience is let in on the joke -- this is not real. Absolutely nothing in this film is real, or warrants logic or credibility. Of course, there is a plot, but just so that the jokes fit together in convenient sequence. The end result is fast, freakish, farfetched and simply fabulous. 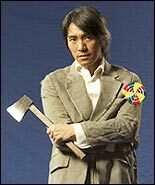 Stephen Chow, the awesomely talented actor-director, plays Sing, a young lout who tries to boss around what he assumes are an easy target -- the residents of Pig Sty Alley. He attempts this with a rotund sidekick who often falls asleep, whose only job in the equation is to look tough. He fails at this, horribly, even as Sing tries to act as if they are vile members of the Axe Gang. As is expected, the real Axes show up, and prepare to terrorise the little alley. But, like the inhabitants of a small Gaulish village might do, the people of Pig Sty resist. And they do this with unbelievable martial arts (and CGI) gusto -- watch out for the tailor and his shower curtain rings. Sounds like a Jackie Chan film? No. Because this floats so delightfully in the realm of the absurd that we aren't even supposed to take the flying kicks for real. Does this make it faux martial arts, like The Matrix? Again, nope. This is good old kung fu, but as if made by an overzealous Pixar bartender, it's laced benevolently with special effects and crazy ideas, making for an insane, phantasmagorical, extravagant cocktail. Drink up. Kung Fu Hustle is also a heavily referenced film, which brings up the inevitable parallels to Kill Bill Vol 1, also a mightily referencing tribute to Shaw Brothers cinema, the films defining greatness in the martial arts genre. But this is far more accessible, the jokes simpler and more slapstick, the humour more obvious, and the references easy -- a lot more Shrek 2 than The Bride. There is subtle cleverness here, and tons of movie-geekery, of course, but there's a total lack of condescension from the filmmaker, resulting in this universally appealing disasterpiece. There is a filmmaking theory that comes to mind with all this referencing, which is that all films are essentially the same, only, lets say, 'dressed' differently. As we look at how Sing and his sidekick resemble Jay and Silent Bob (from the Kevin Smith films), we're reminded of how the portly Bob is a lot like Bud Spencer, which brings us back to Sing's Terrence Hill. Those two rogues from old Hollywood westerns, of course, were but Stan and Ollie with their personalities interchanged. And so forth. Even the most obvious cinematic digs are a blast, because of the unexpected context. There's the time a kung fu master calls another to whisper his dying words to her, 'with great power comes great responsibility', a la Spiderman's Uncle Ben; the time the hallways fill with blood is straight out of The Shining. And then there's the poster in the background as Sing struggles with his awkward, maudlin romance -- a poster of Irving Berlin's classic musical Top Hat, with Ginger Rogers in Fred Astaire's arms, reminding us all too clearly what a film like this is about: comic timing, yes, but most importantly, incredible choreography. The fight sequences are magnificently inspired, and in a nod to the legends, Chow gets Sammo Hung to guest direct a couple of them -- one of which is possibly among the film's most compelling, where two 'musicians' playing some truly lethal strings square off against three masters of the craft. The characters in the film are fascinating cartoons -- the landlady, with the cigarette in her mouth, who runs like Road Runner; the deceptively pathetic looking Beast, who is a rubber-slipper clad killing machine like no other, and resorts to fighting in the ludicrous Bullfrog style; and Sing himself, who pummels out his wounds and thrashes out a traffic signal in pure Popeye style to heal himself. But in between the raucous hilarity, we are taken by surprise because of the sheer grace of it all. The plot leaps forth, from martial arts cliché to Hollywood staples. Sing is 'The Chosen One,' the one-in-a-millenium genius born with kung fu genes, which means he inevitably has to fight evil. There is also a subplot, of love and lollipops, and it is so gloriously irreverent that you can't help but grin through it all. This is escapism at its best: dripped with adrenalin, more than suitable for all audiences, and made with an earnest, infectious joy that spreads to the audience. Sing, flying through the air, steadies himself superbly by putting his foot on the back of a passing eagle, and we are only too willing to believe. It's not real at all, but it's fantastic.